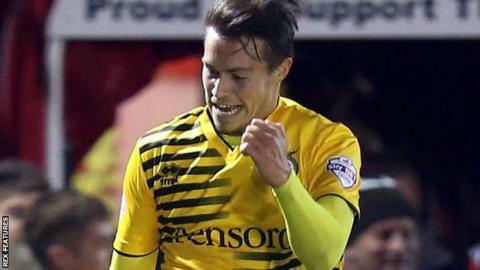 Bristol Rovers moved into the play-off places with a win that sent Dagenham & Redbridge bottom of League Two. Lee Brown beat goalkeeper Mark Cousins with a powerful shot from a well-worked free-kick routine to open the scoring. Rovers doubled their lead late on when Rory Gaffney rounded off a swift counter-attack with a curled effort. Billy Bodin finished off the scoring in stoppage time to hand the Daggers their third straight defeat and increase pressure on manager Wayne Burnett. "We've conceded three goals at home, very, very disappointing. Another home defeat and another disappointment. "I've never quit in anything that I've done. If the board decide that they want to sack me, then that's out of my hands. "I think three-nil flattered them a little bit, but overall they deserved to win." Match ends, Dagenham and Redbridge 0, Bristol Rovers 3. Second Half ends, Dagenham and Redbridge 0, Bristol Rovers 3. Goal! Dagenham and Redbridge 0, Bristol Rovers 3. Billy Bodin (Bristol Rovers) left footed shot from the centre of the box to the bottom right corner. Assisted by Ollie Clarke. Attempt blocked. Jack Connors (Dagenham and Redbridge) right footed shot from outside the box is blocked. Corner, Dagenham and Redbridge. Conceded by Tom Lockyer. Attempt blocked. Kyle Vassell (Dagenham and Redbridge) right footed shot from outside the box is blocked. Attempt saved. Rory Gaffney (Bristol Rovers) right footed shot from outside the box is saved in the top centre of the goal. Goal! Dagenham and Redbridge 0, Bristol Rovers 2. Rory Gaffney (Bristol Rovers) right footed shot from the centre of the box to the bottom right corner. Assisted by Matty Taylor. Corner, Dagenham and Redbridge. Conceded by Lee Brown. Corner, Bristol Rovers. Conceded by Clévid Dikamona. Substitution, Bristol Rovers. Billy Bodin replaces Daniel Leadbitter. Attempt missed. Clévid Dikamona (Dagenham and Redbridge) right footed shot from the centre of the box is just a bit too high. Substitution, Dagenham and Redbridge. Kyle Vassell replaces Jodi Jones. Substitution, Dagenham and Redbridge. Jamie Cureton replaces Christian Doidge. Clévid Dikamona (Dagenham and Redbridge) is shown the yellow card for a bad foul. Attempt blocked. Nyron Nosworthy (Dagenham and Redbridge) right footed shot from the centre of the box is blocked. Corner, Dagenham and Redbridge. Conceded by Steve Mildenhall. Attempt saved. Joss Labadie (Dagenham and Redbridge) right footed shot from outside the box is saved in the bottom right corner.